Horeca Professional – a line of products designer for customers in the catering and hospitality sector. The washer brand and the brands associated with, offer high quality products, essential in the restaurant business and hotels on the highest level. 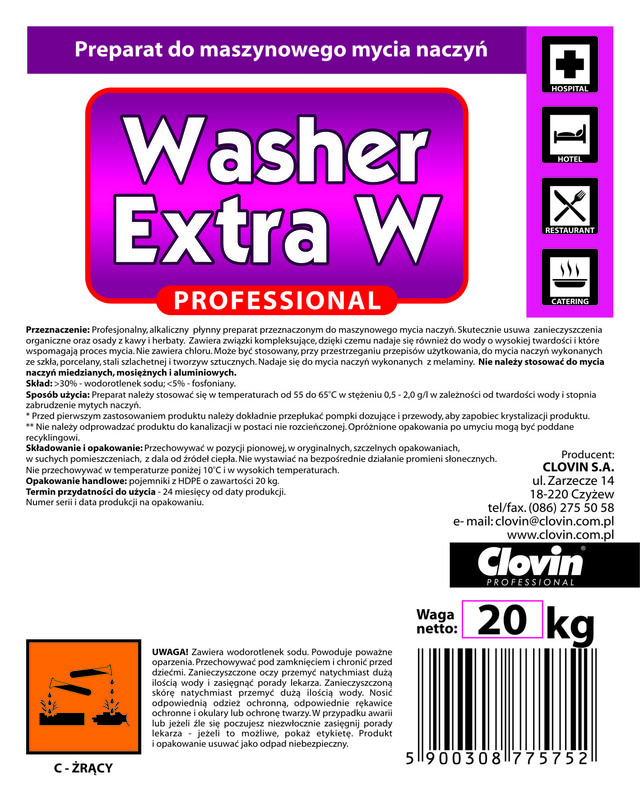 A detergent for use in dishwashers. 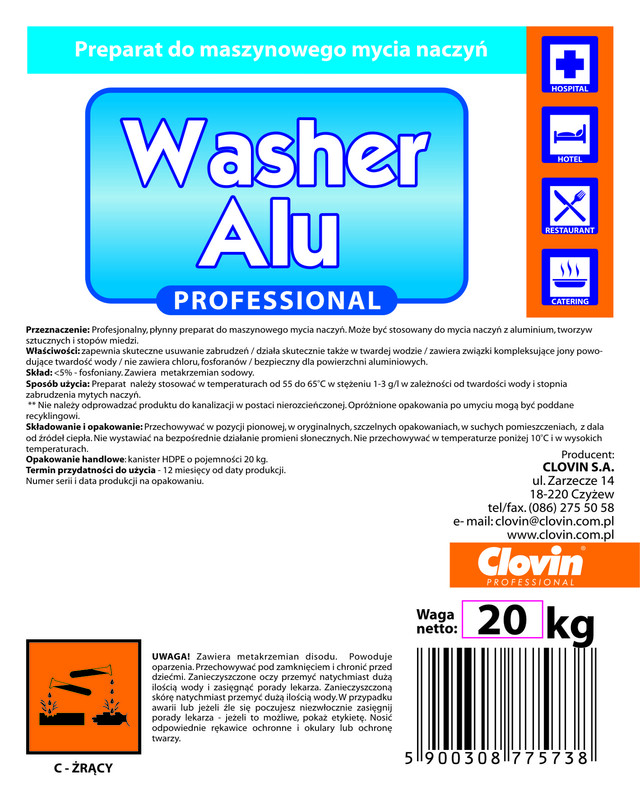 An alkaline washing liquid detergent designed for dishwashers. Effectively removes organic impurity and sediments from coffee and tea. It contains complexing agents that assist the washing process, making it suitable also for water with high hardness. It can be used, provided compliance with the rules of use for washing dishes made of glass, porcelain, stainless steel and plastic. Suitable for washing dishes made of melamine. Do not use while dishwashing copper, brass and aluminium dishes. It does not contain chlorine. 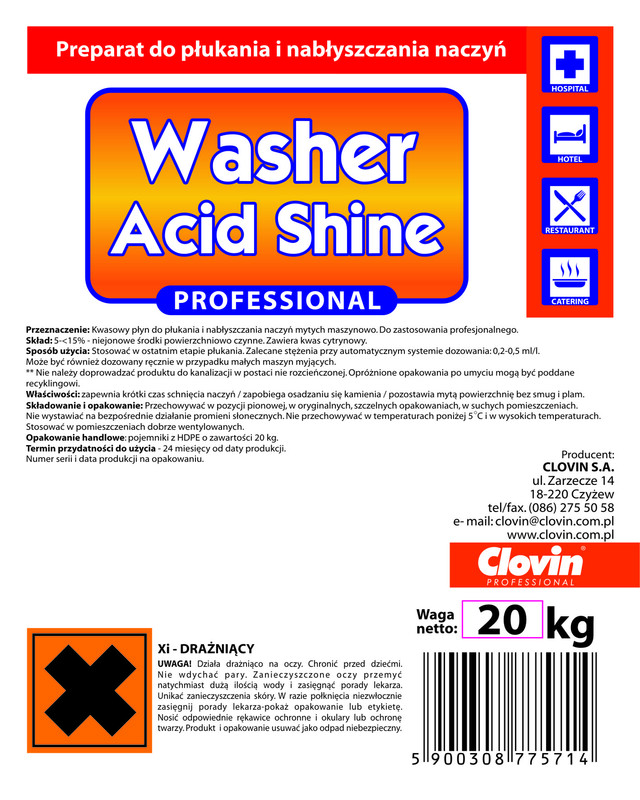 A preparation for machine dishwashing with an active chlorine. 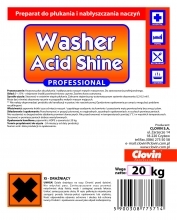 The liquid detergent for machine dishwashing with bleaching action. It includes compounds based on an active chlorine. It also contains complexing agents, making it suitable for water with average degrees of hardness. Designed for use in all industrial dishwashers. 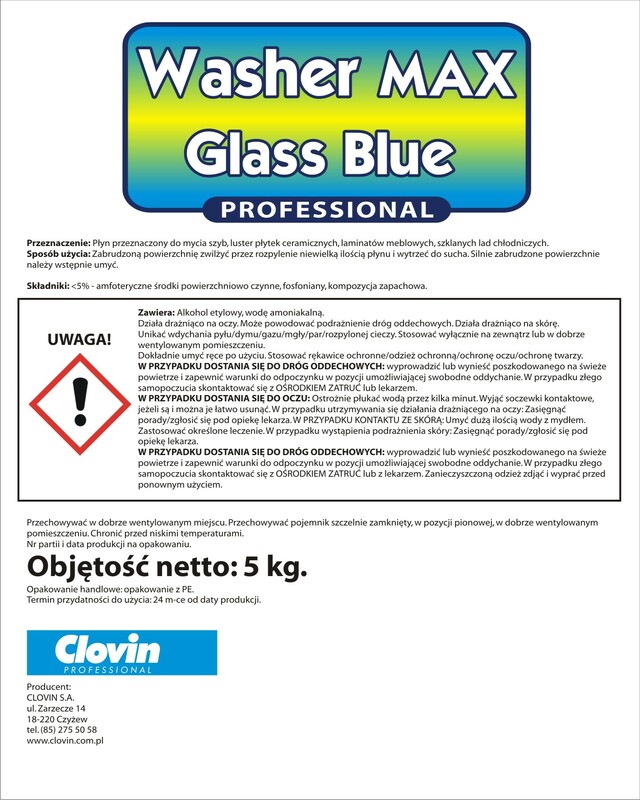 Subject to compliance with the manufacturer's recommendations the preparation can be used for washing dishes made of glass, stainless steel and plastic. It is not recommended to wash dishes made of melamine and surfaces sensitive to alkali i.e. made of copper, brass, aluminium or rubber. 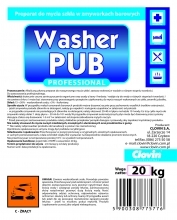 A detergent for washing glass in the bar dishwashers. 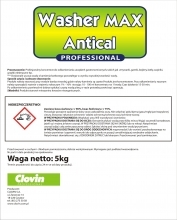 An alkaline liquid detergent for automated cleaning of glass and tableware in water of various hardness. It effectively removes deposits from coffee and tea. It does not contain chlorine. 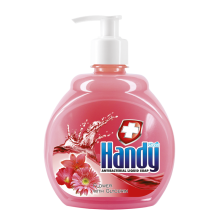 A concentrated, neutral liquid with washing and nourishing properties and a pleasant orange scent. It evaporates quickly, does not leave streaks, sustains shine. Suitable for all shiny and semi-matt surfaces. - Machine washing: 50-100 ml / 10 l of water. It does not require rinsing. The liquid formulation for machine dishwashing. 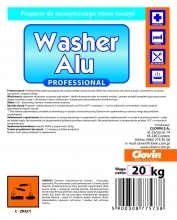 It can be used for washing dishes made of aluminium, plastic and copper alloys. It does not contain chlorine. 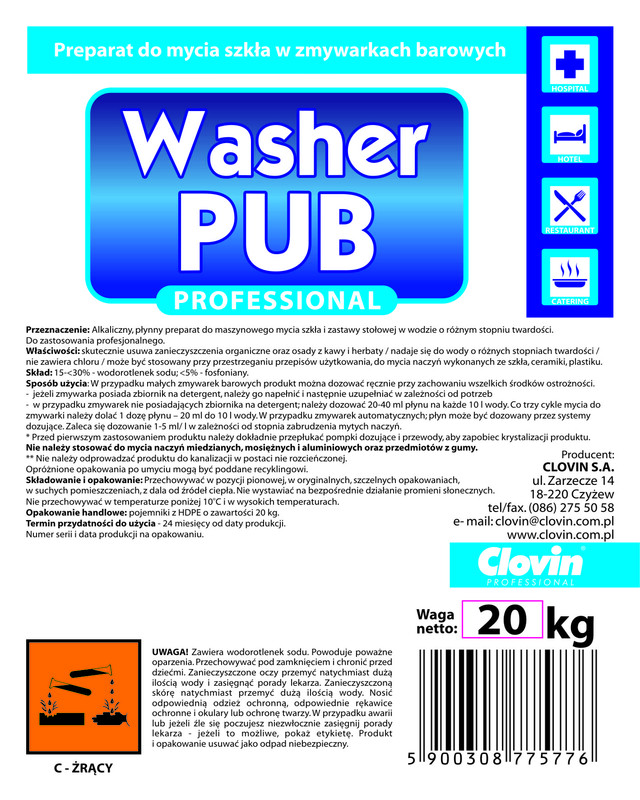 An acidic liquid for rinsing and polishing dishes in dishwashers. It provides short drying time of dishes, prevents scaling, leaves the cleaned surface without streaks and stains. 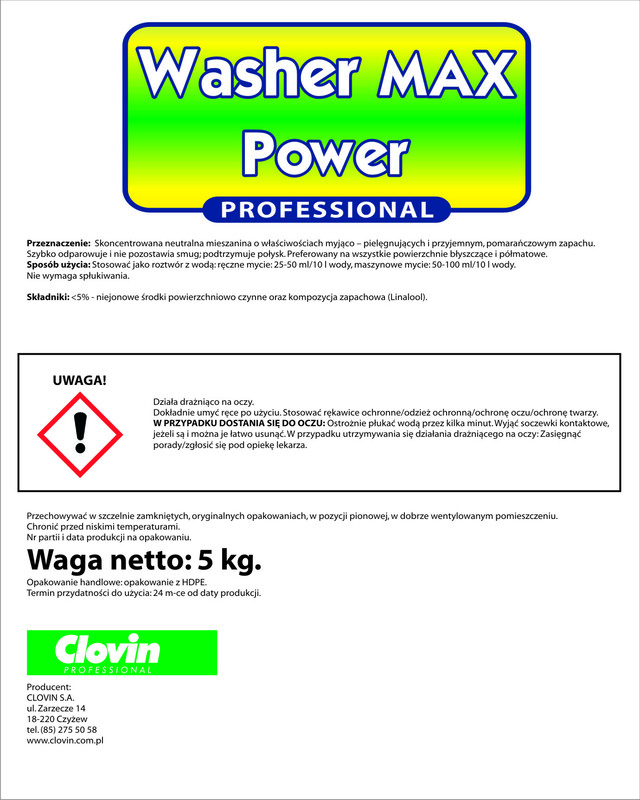 Suitable for use with the entire line of Washer detergents for dishwashers. It does not contain chlorine. 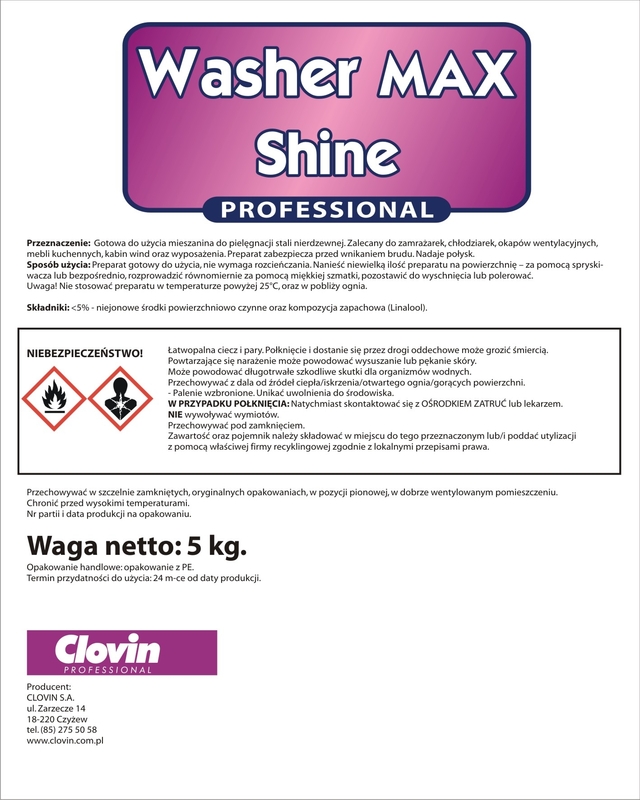 An alkaline, low-foaming detergent with a degreasing-cleaning properties to everyday and intensive cleaning of floors resistant to alkaline substances. 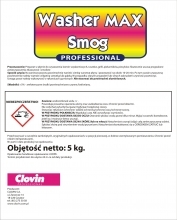 Perfectly dissolves old impurities from animal or vegetable fat, and petroleum pollution. 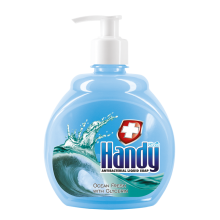 It works perfectly with hard, cold water. 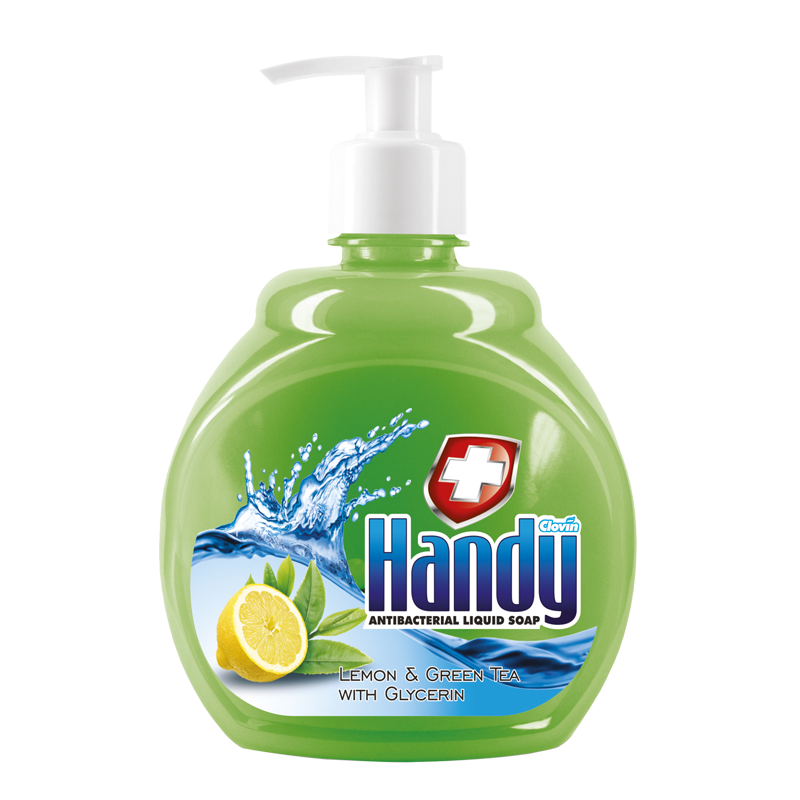 Suitable for all types of hard surfaces in the kitchen and gastronomy. - Daily cleaning: 25-50 ml / 10 l of water. 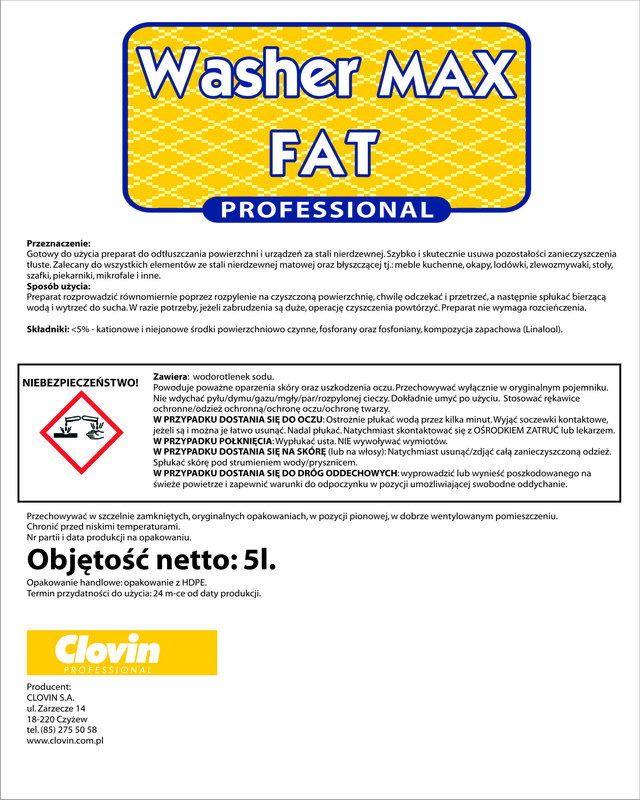 A ready-to-use preparation for degreasing surfaces and stainless steel devices. 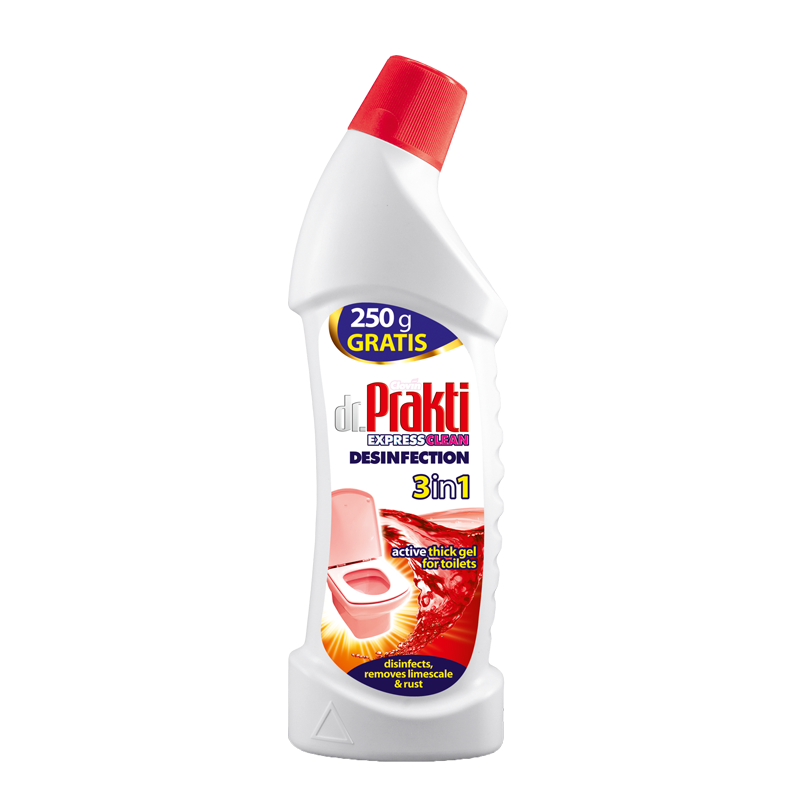 Quickly and effectively removes residues, greasy dirt. Recommended for all stainless steel matte and glossy items i.e. : kitchen furniture, hoods, refrigerators, sinks, tables, cupboards, ovens, microwaves and others. The agent should be distributed through spraying the surface to be cleaned, waiting a moment and wiping, then rinsing with running water and wiping dry. If needed or if the dirt is large, repeat the cleaning. The preparation does not require dilution. A liquid preparation for cleaning smoking chambers, grills, griddles, ovens, stoves. 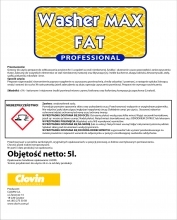 Effectively removes burnt fat and tar contamination. Apply a thin layer of the preparation on the contaminated surface and leave it for about 10-20 minutes. After this time, the surface should be cleaned with a damp cloth or sponge. In the case of old burns or stubborn dirt, repeat the procedure. Warning! The work must be performed in rubber gloves. 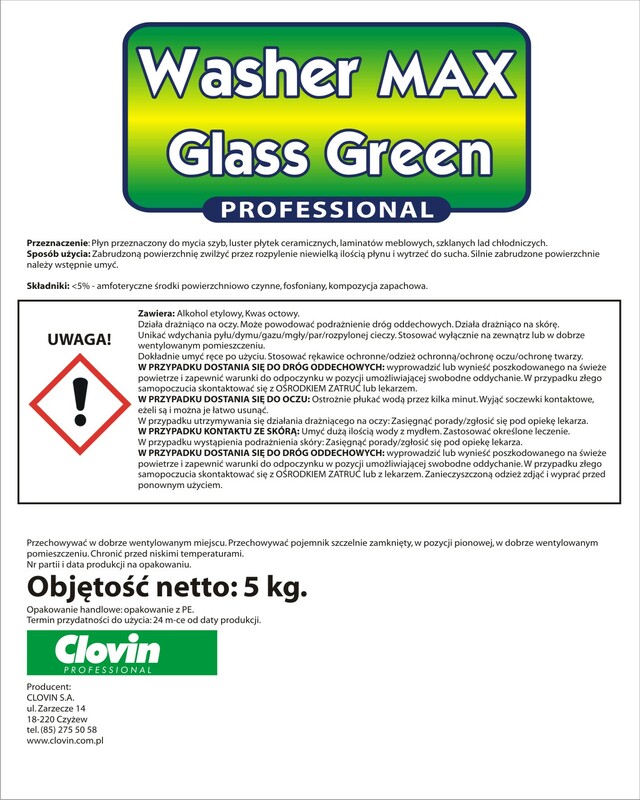 Do not use on aluminium surfaces. 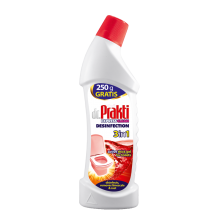 A liquid designed for cleaning glass, mirrors, ceramic tiles, laminates, furniture, glass showcases. Moisten the dirty surface by spraying a small amount of liquid and wipe dry. Heavily soiled surfaces should be pre-washed. The preparation based on alcohols and ammonia. 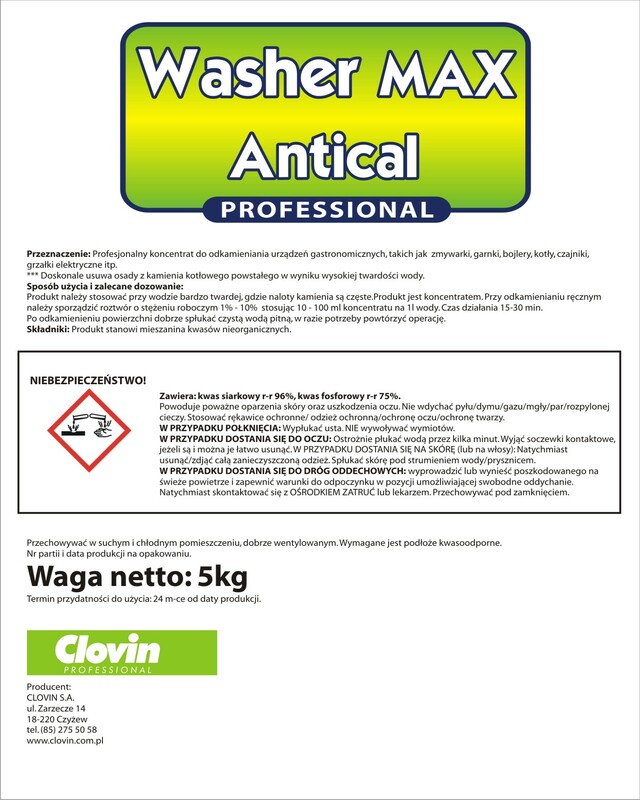 A professional concentrate for decaling catering equipment such as dishwashers, pots, boilers, cauldrons, kettles, electric heaters, etc. Perfectly removes scaling deposits, resulting from the high water hardness. The product should be applied when the water is very hard, where the stone raids are frequent. The product is a concentrate. While manual decaling, solution should be prepared with a working concentration of 1-10% using 10-100 ml of concentrate per 1 litre of water. The operating time is 15-30 minutes. After decaling the surface, rinse well with clean running water. If necessary, repeat the action. 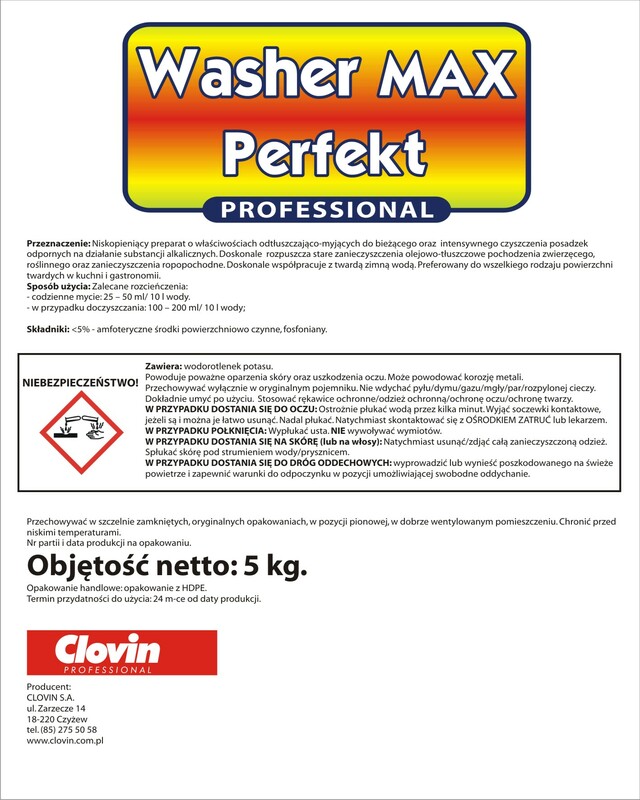 A liquid preparation for professional use and for the disinfection of surfaces and equipment in catering, grocery stores, catering establishments, food factories, etc. The formulation can be applied directly to the surface while travelling, at home and in the office. It can be applied by spraying, hand, dip and through fogging. 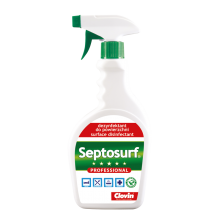 After checking the quality of washed surfaces it should be disinfected with a solution of SEPTOSURF preparation. In the treatment of large surfaces SEPTOSURF should be used at temp. about 20 ° C for 15 minutes, under dirty - at a dilution of 1: 100 (1% solution) and clean - at a dilution of 1: 200 (0.5% solution), consuming 0.25 litres of solution per 1m2 surface. After disinfecting, surfaces in contact with food must be thoroughly rinsed with water of drinking water quality. To disinfect large household surfaces, pour 20 ml of SEPTOSURF to 4 litres of water with your favourite floor’s cleaner. After washing, allow to dry. 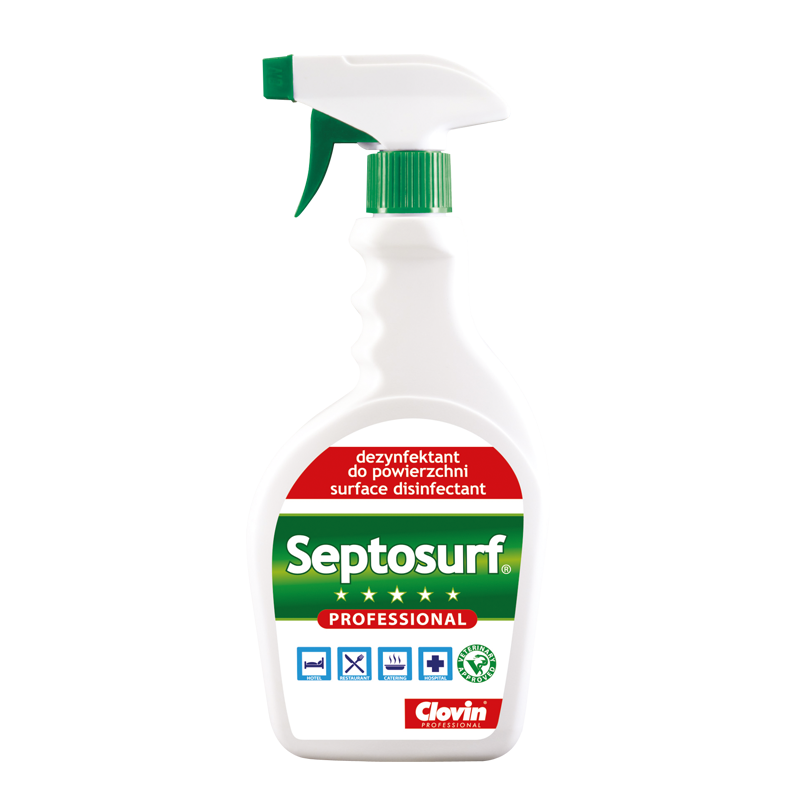 SEPTOSURF at a concentration of 0.5% (5 ml / litre of water) is fungicidal and bactericidal. It holds a permission for marketing as a biocidal product. 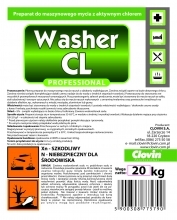 The liquid is intended for cleaning and disinfecting toilets. It is disinfecting. At a concentration of 100% (t = 5 min, temp. 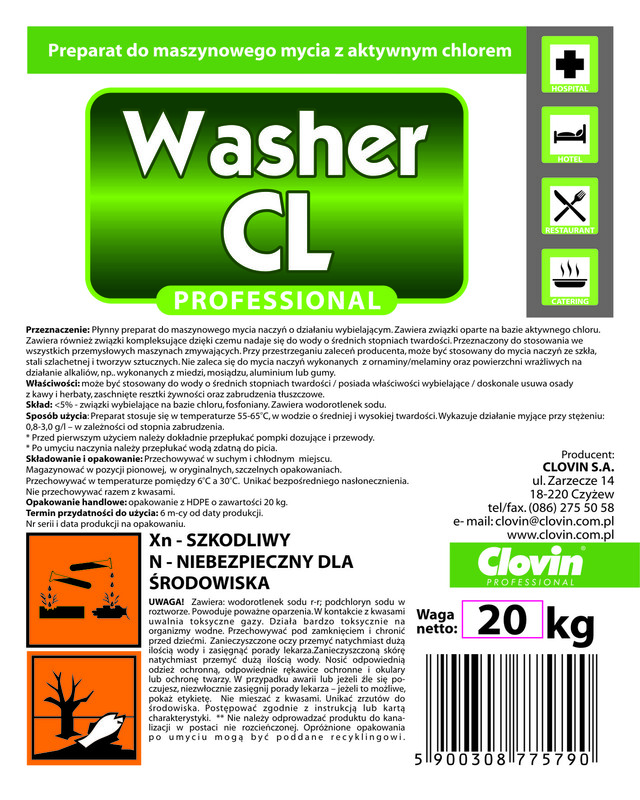 20 ° C) shows bactericidal and fungicidal properties for dirty conditions. Pour the surface with the preparation, starting from the periphery of the shell. After 10 minutes rinse with water. With stubborn dirt, wash the shell with a brush. It holds a permition for marketing as a biocidal product. 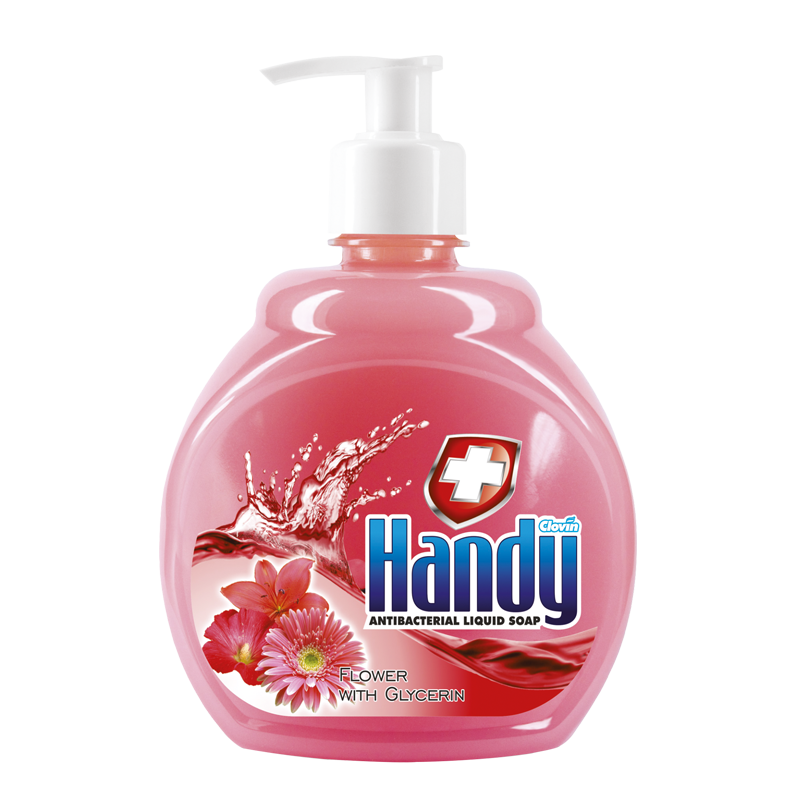 A liquid soap for washing hands and body skin. 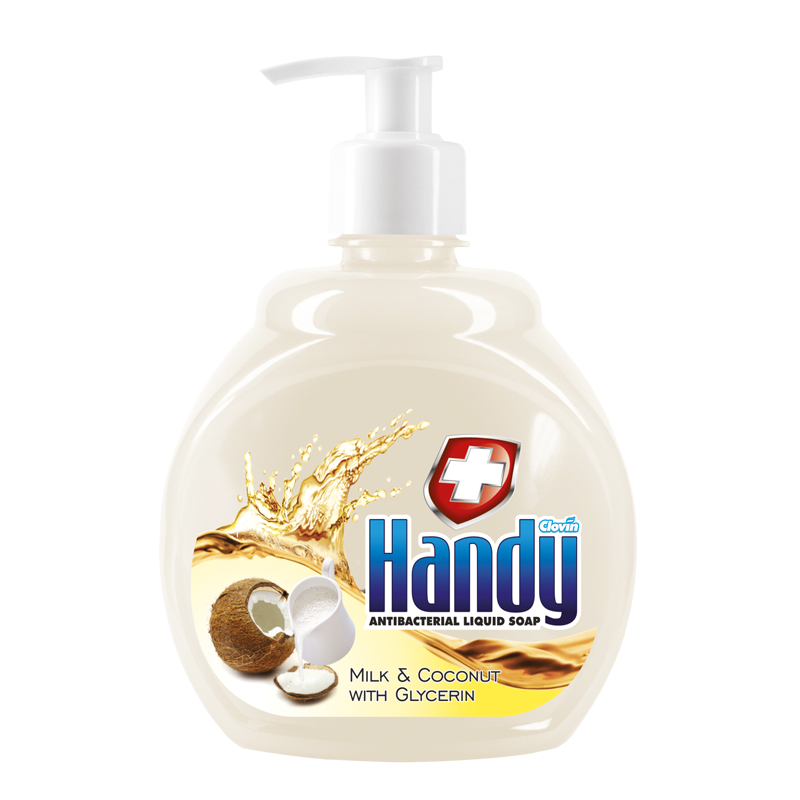 It has excellent nourishing properties, gives the skin lubrication and softness. 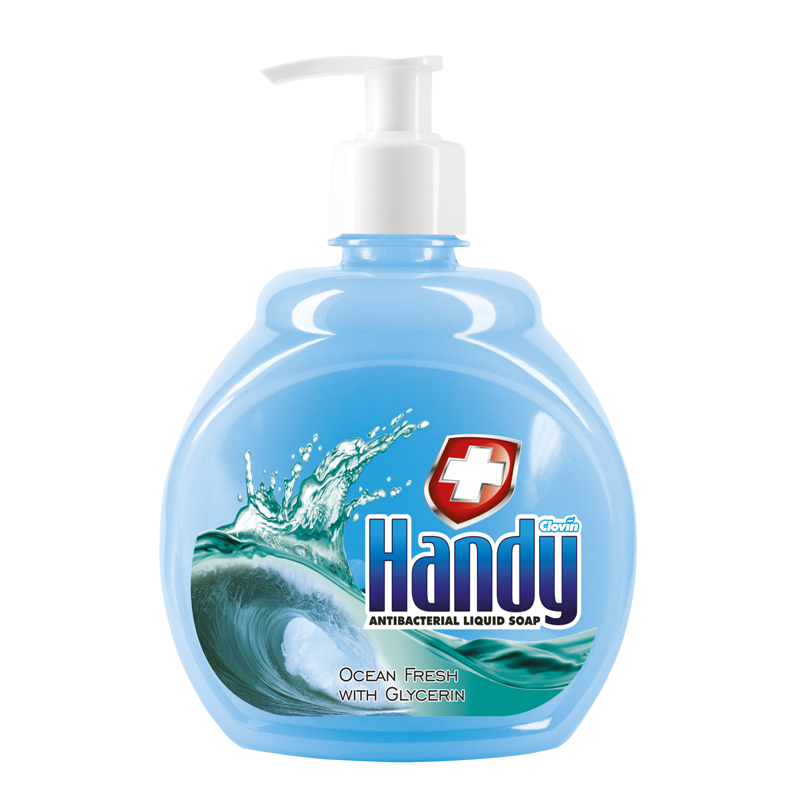 Nice and pleasant Sea fragrance. Nice and pleasant floral aroma. 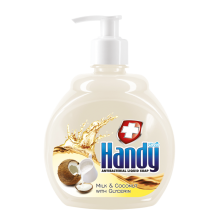 Nice and pleasant scent of coconut milk. Reported to the list of CPNP. Nice and pleasant fragrance of green tea. 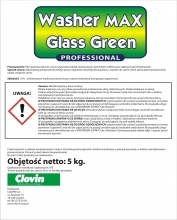 A liquid designed for cleaning glass, mirrors, ceramic tiles, laminates, furniture, glass showcases. Moisten the dirty surface by spraying a small amount of liquid and wipe dry. Heavily soiled surfaces should be pre-washed. The preparation based on alcohols and acetic acid. A ready-to-use mixture for stainless steel maintenance. 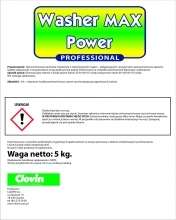 Recommended for freezers, coolers, cooker hoods, kitchen furniture, lift cabins and equipment. The substance protects against dirt’s penetration. Gives gloss. Apply a small amount of product on the surface directly or with a sprinkler. Spread evenly with a soft cloth, let it dry, then polish it. Warning! 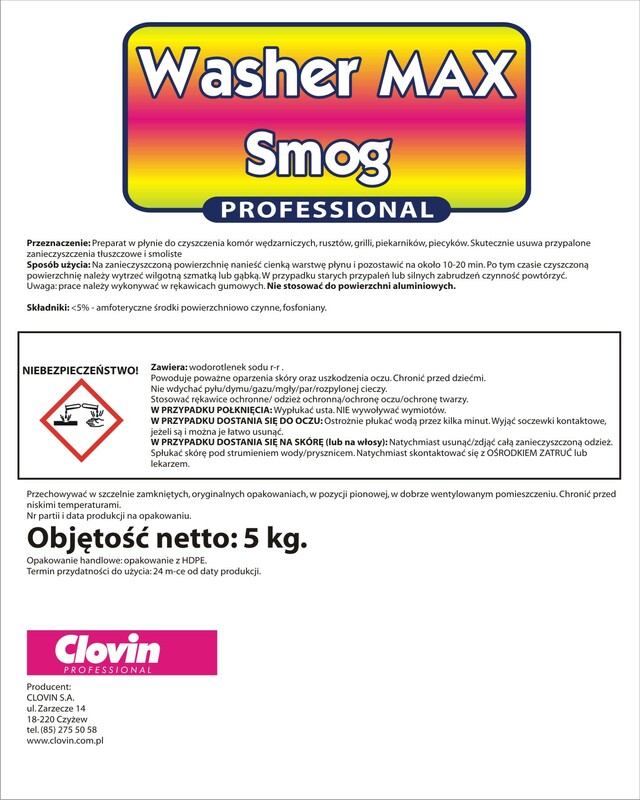 Do not use the product at temperatures above 25°C and in the vicinity of the fire. The substance is ready to use and does not require dilution.